There are any number of reasons that a person might have for looking forward to Donald Trump’s first State Of The Union address on January 30—including the likelihood that it’ll be a disaster or that it’ll give them a good excuse to completely disengage from TV and the internet for a night—but Comedy Central is now trying to give people another reason to be excited about it. 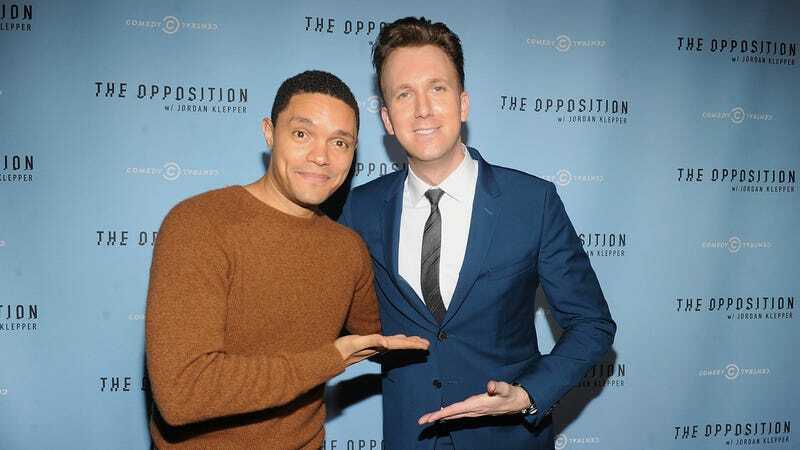 As reported by Variety, the network has announced that both The Daily Show With Trevor Noah and The Opposition With Jordan Klepper will both be airing live episodes that night, with both shows also simulcasting the first segment of their broadcasts on Facebook. As Variety notes, this seems like an attempt to replicate some of the success that shows like this enjoyed during the presidential election, when many shows went live for the Republican National Convention and Democratic National Convention. This is all also assuming that Trump will actually hold a State Of The Union as planned, as he might have a hard time fitting it into his busy golf schedule.